Definition at line 26 of file CLImage.h. Definition at line 24 of file CLImage.cpp. References CKeyFactory::add(), CCopasiRootContainer::getKeyFactory(), and mKey. Definition at line 41 of file CLImage.cpp. Constructor to generate object from the corresponding SBML object. Definition at line 58 of file CLImage.cpp. Definition at line 75 of file CLImage.cpp. Definition at line 116 of file CLImage.cpp. Referenced by CLLayoutRenderer::draw_image(), fillItemFromImage(), and CCopasiXML::saveImageElement(). Definition at line 132 of file CLImage.cpp. Returns the key string of the object. Returns the key of the color definition. Definition at line 232 of file CLImage.cpp. Definition at line 108 of file CLImage.cpp. Definition at line 198 of file CLImage.cpp. Definition at line 174 of file CLImage.cpp. Definition at line 206 of file CLImage.cpp. Definition at line 182 of file CLImage.cpp. Definition at line 214 of file CLImage.cpp. Definition at line 190 of file CLImage.cpp. Returns true if the image reference has been set. Definition at line 222 of file CLImage.cpp. Definition at line 140 of file CLImage.cpp. References mX, mY, and mZ. Definition at line 83 of file CLImage.cpp. Definition at line 100 of file CLImage.cpp. Sets the reference to the image location. Definition at line 124 of file CLImage.cpp. Definition at line 92 of file CLImage.cpp. Definition at line 150 of file CLImage.cpp. Definition at line 158 of file CLImage.cpp. Definition at line 166 of file CLImage.cpp. Converts this object to the corresponding SBML object. Definition at line 240 of file CLImage.cpp. 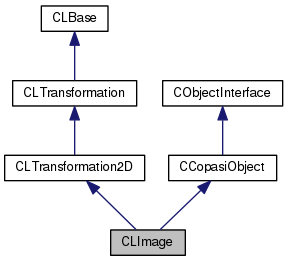 References CLTransformation2D::addSBMLAttributes(), mHeight, mHRef, mWidth, mX, mY, mZ, and CLRelAbsVector::toSBML(). Definition at line 37 of file CLImage.h. Referenced by getHeight(), setDimensions(), setHeight(), and toSBML(). Definition at line 38 of file CLImage.h. Referenced by getImageReference(), isSetImageReference(), setImageReference(), and toSBML(). Definition at line 43 of file CLImage.h. Referenced by CLImage(), getKey(), and ~CLImage(). Definition at line 36 of file CLImage.h. Referenced by getWidth(), setDimensions(), setWidth(), and toSBML(). Definition at line 33 of file CLImage.h. Referenced by getX(), setCoordinates(), setX(), and toSBML(). Definition at line 34 of file CLImage.h. Referenced by getY(), setCoordinates(), setY(), and toSBML(). Definition at line 35 of file CLImage.h. Referenced by getZ(), setCoordinates(), setZ(), and toSBML().